Melissa Flagg, COA, OSC, has worked in the medical field for over two decades as an ophthalmic technician and is certified by JCAHPO. 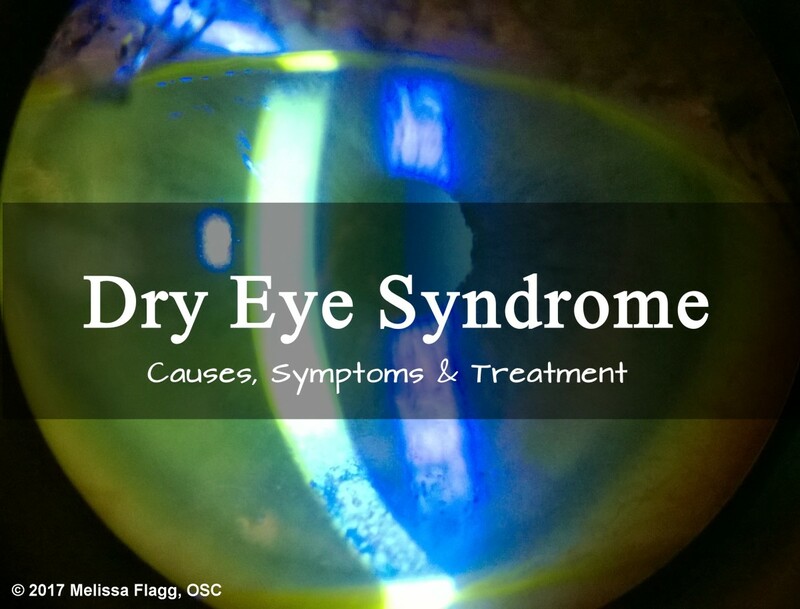 Itching, watering/tearing, burning, redness, blurry or cloudy vision, foreign body sensation (like a lash under the lids), and light sensitivity are all symptoms of a common condition known as Dry Eye Syndrome. It affects just about everyone at some point in their lives. Many people suffer this syndrome chronically, leading to the inability to perform day-to-day activities and functions. It can be very uncomfortable and, if left untreated, can lead to scar tissue that causes permanent vision loss. Chronic dryness is also known by the medical term keratoconjunctivitis sicca. This term can be deceiving to patients since conjunctivitis is also the medical term for pink eye, which is viral conjunctivitis. 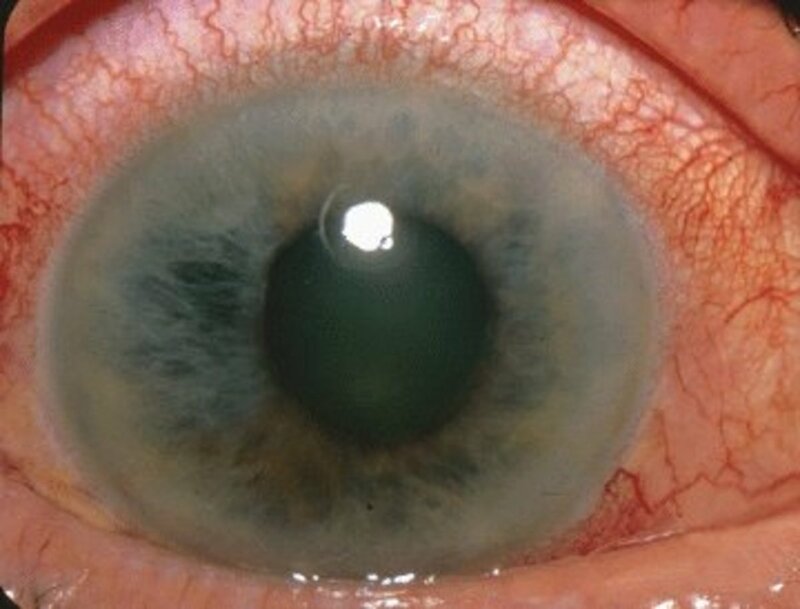 Keratoconjunctivitis specifically refers to the cornea. The prefix kerato in Latin means cornea. Keratoconjunctivitis sicca is a Latin term and literally means dry inflammation of the cornea and conjunctiva. Before we get into the chronic version of the disorder, let’s take a look at intermittent dry eyes and its causes. The intermittent version of the disorder, also called evaporative dry eyes, can be caused by a number of different things. The most common complaint is irritation when reading or working on a computer. What most people don’t know is that this is completely normal. When working on a computer, or reading for long periods of time, we don’t blink as much as we would normally. Blinking rehydrates the cornea with a fresh layer of tears. Because we’re concentrating when doing tasks up close, such as reading, we blink less and the tear film on the cornea evaporates more quickly. 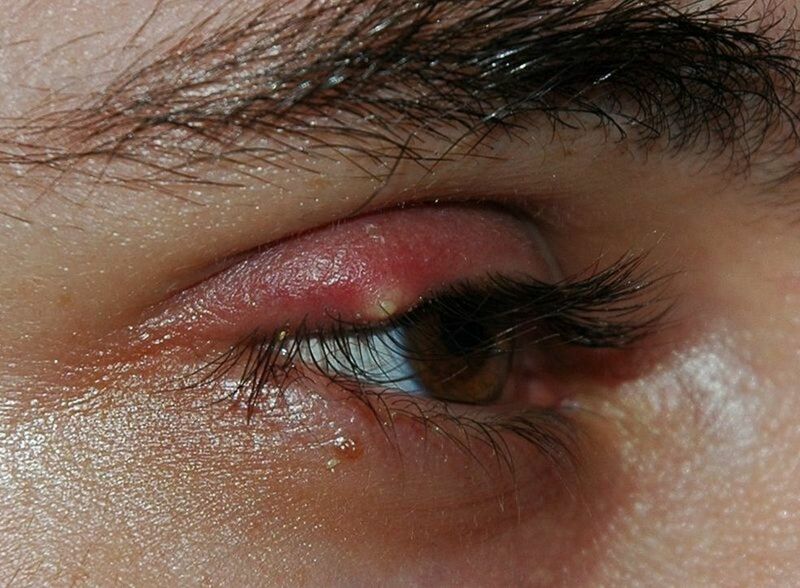 This can cause irritation such as a foreign body sensation (a sandy feeling), redness, burning, itching, scratching, cloudy vision and even light sensitivity (photophobia). 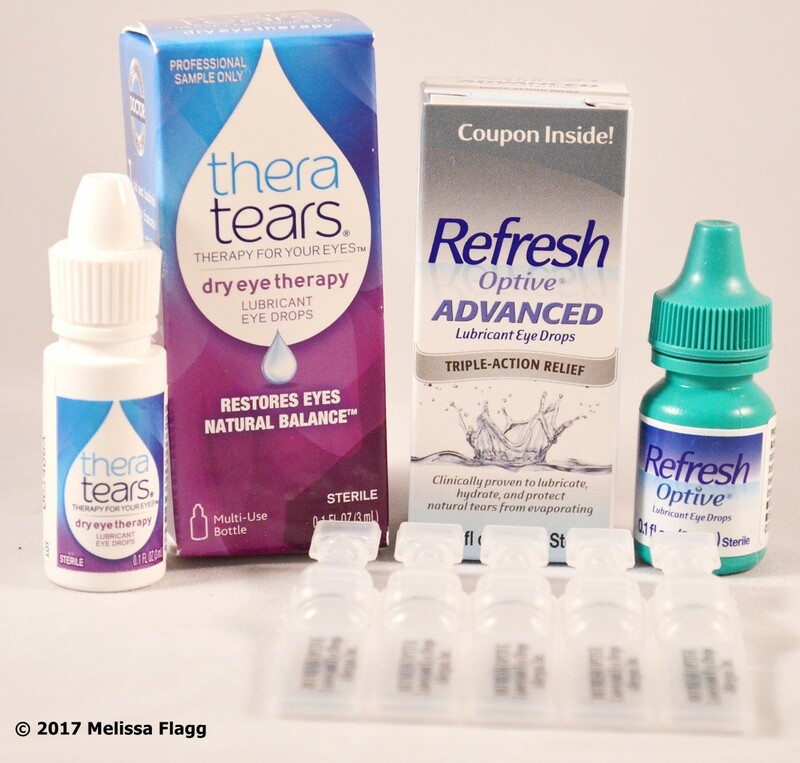 To prevent the cornea from drying out, artificial tears can be used periodically. These “fake tears” won’t evaporate as quickly as your own tears even if you don’t blink frequently. Taking breaks from reading or computer work at least every 45 minutes to an hour, and focusing on something in the distance or simply walking around for ten or twenty minutes will refresh the tear film. 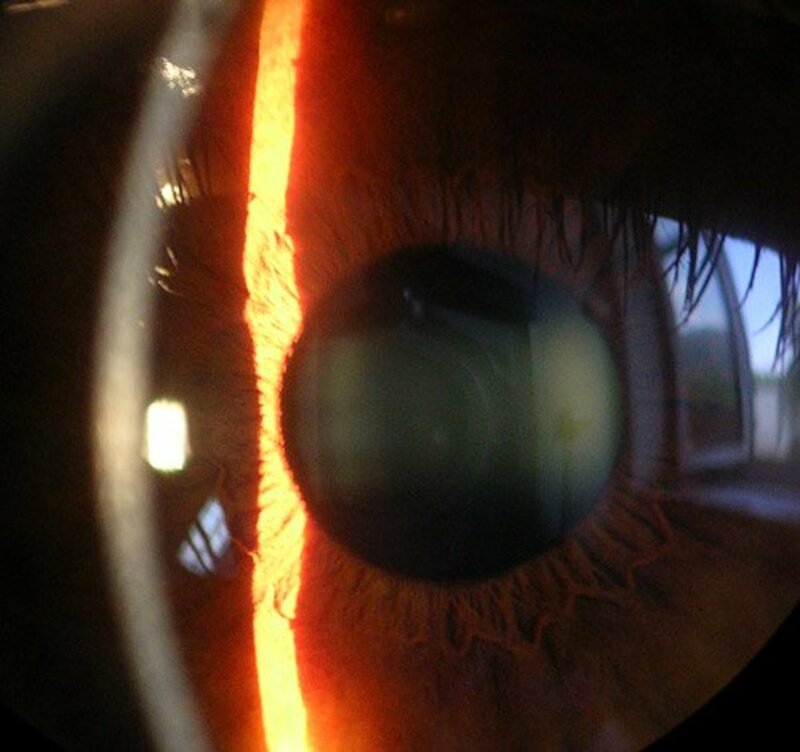 The image above shows the difference between a hydrated cornea and one with an evaporated tear film, in the same eye. 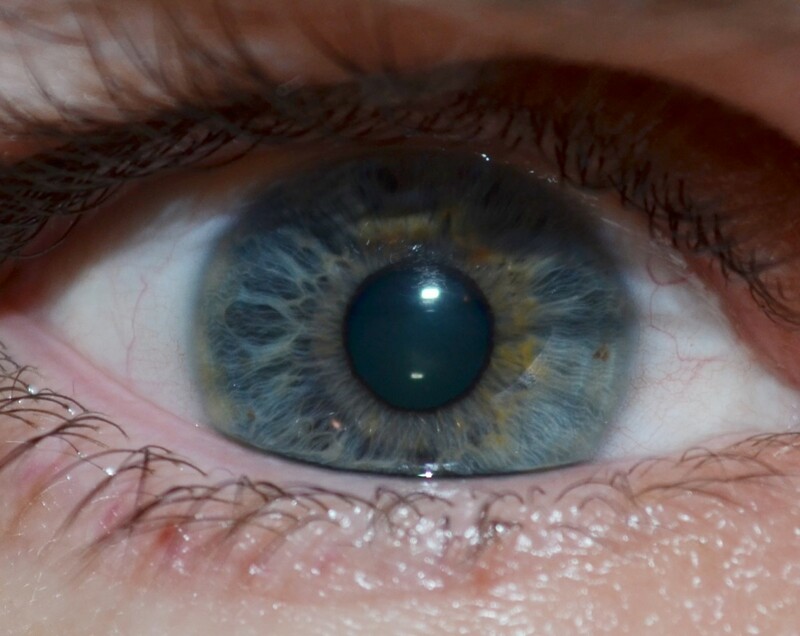 The eye has been dyed with a yellow drop called fluorescein. 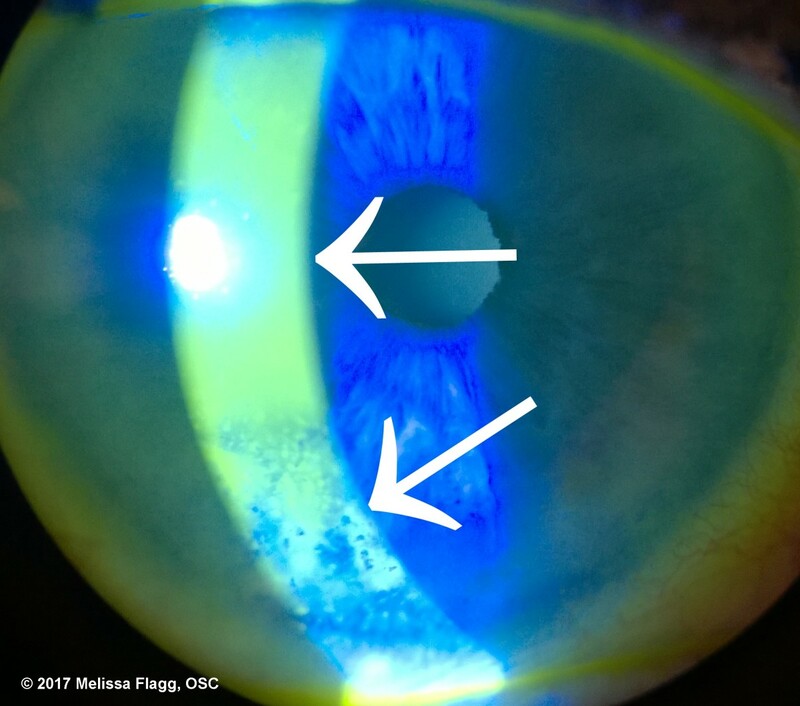 Using a cobalt blue filter on the slit lamp, the fluorescein allows us to visualize the tear film. The upper arrow points to the healthy tear film. It is smooth and coats the eye properly. The lower arrow points to an area of the tear film that has been allowed to evaporate. Notice that it is on the lower quarter of the cornea. This is because the patient does not close their eyes completely when they sleep and the exposed tear film is allowed to evaporate. This causes the spotting you see in the image. This spotting is actually little micro-abrasions on the cornea. They can make the eye feel like there is something in it constantly, and many patients mistake this sensation for an actual foreign body in the eye (like an eyelash). Artificial tears can help provide relief in this situation, but they need to be used frequently. Every two hours is preferable, but even four times a day will help. Let’s look at each cause individually. As we age, the lipid layer of the tear film becomes depleted. This layer's primary job is to keep the tear film from evaporating rapidly. Normal evaporation time should be over ten seconds; anything lower can be considered a symptom of dry eye. This rapid evaporation can lead to chronic irritation, burning, itching and over production of tears (called epiphora). Epiphora is the body’s way of compensating for the rapid evaporation and it can cause tears to constantly stream down the face if the dryness is extremely severe. 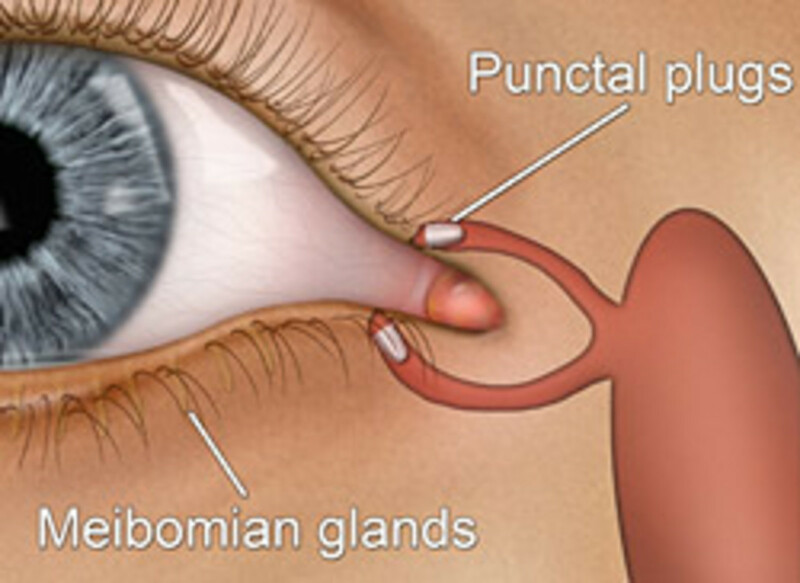 Meibomian glands, or tarsal glands, are oil secreting glands that are located in the tarsal plate of the eyelid. These glands secrete meibum a substance rich in lipids (fats) and about 90 different proteins in the meibum secreted. It forms the lipid layer of the tear film, which protects the tears from evaporating. These glands can be afflicted with chronic blockages, or the meibum can become thickened and no longer secreted easily. 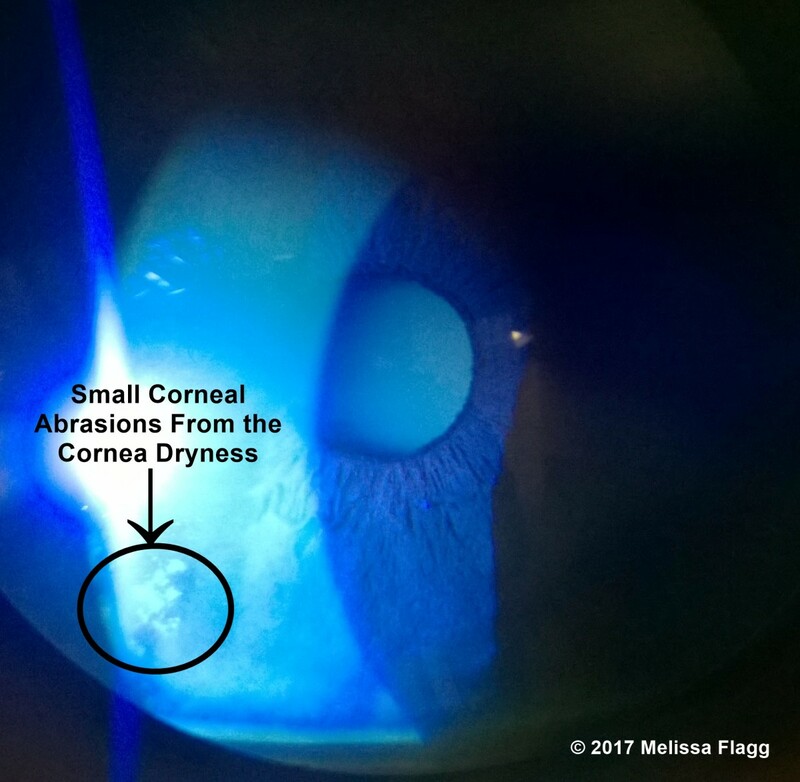 When the meibomian glands cease to function properly, the tear film evaporates causing the symptoms typically associated with dryness. Blepharitis is a common yet annoying condition. It can be described as dandruff of the lids. The skin around the lashes becomes scaly and starts to flake. If left untreated, the debris can clog the meibomian glands causing MGD and dryness. Blepharitis is typically a chronic disease that needs to be treated daily, but can be easily controlled. Contact lenses are a phenomenal invention. They allow many people with difficult prescriptions to be able to see without glasses. However, wearing contact lenses for prolonged periods, even if you take them out nightly, leads to corneal desensitization. Once the cornea has become desensitized, it can no longer prompt the eye for tears, and allows the eye to dry out. This can cause the contact lens wearer to be unable to continue wearing lenses altogether or drastically reduce the length of time they can wear the lenses comfortably. There is treatment for this, which can allow the patient to keep wearing contacts for years to come. Inadequate tear production or a depleted lipid layer can be the result of autoimmune diseases such as Sjogren’s syndrome, lupus, rheumatoid arthritis, or Wegener’s granulomatosis. In these diseases, the immune system attacks normal, healthy cells and tissue causing inflammation and damage. In the case of Sjogren’s syndrome, the exocrine glands that produce tears and saliva are attacked by the immune system and destroyed. This prevents the eye from producing enough tears to keep the eye moist and clean. The tear film not only hydrates the cornea, with each blink it also flushes out microbes and other debris from the eye. When the tear film is not sufficient to keep the eye moist, it also can’t keep the eye clean, which can lead to chronic infections and eventually permanent vision loss. Even metabolic diseases can cause dry eye syndrome. Conditions such as diabetes can upset the delicate balance of the tear film. The medications for these diseases also cause dryness. Many, like Glucophage (metformin), can even cause dehydration because of the frequent urination they cause. Whenever surgery is performed on the eye, whether it is cataract, LASIK or even retinal surgeries like pars plana vitrectomy surgery, the eye will become dryer after the procedure than it was before. This is because most eye surgeries affect the cornea in some way causing it to become desensitized and unable to tell the eye it needs tears. Normally, this isn’t a major issue for the patient and artificial tears usually remedy the problem. There are certain instances where patients may have more severe complications after surgery that result in severe dry eye syndromes, especially if the patient already had dry eyes prior to surgery. For these patients, more aggressive treatments may be necessary to alleviate symptoms and improve quality of life. Last, but not least, medications. There are many pharmaceuticals on the market today that can dry out the eyes. Specifically, narcotics pain medications are notorious for drying out the eyes and the mouth as well. Many hypertensive medications and antidepressants also have this effect. Depending on the dosage of the medication, artificial tears should suffice, unless large amounts of painkillers or other narcotics are being taken. These cases may need further therapy to alleviate symptoms. There are many treatments available for DES. Artificial tears are the first line of defense for DES, especially for dryness caused by reading and computer or other near work. I typically recommend that patients use artificial tears about ten minutes before they start reading or working on the computer. This hydrates the cornea, and since artificial tears last longer than our own tears, the eyes stay moist longer. I also recommend that my patients use artificial tears four times a day minimum if they have any trouble with DES. I suffer the condition myself and in the mornings, upon waking, my eyes feel like sandpaper. I keep a bottle of Refresh tears on my night stand, and before I get up I put a couple drops in, and I’m back to normal. For many people with this syndrome, the symptoms are worse in the morning. This is because most of us don’t close our eyes completely when we sleep, which allows the tear film to evaporate and consequently, the cornea dies out causing cloudy vision and a severe foreign body sensation (like something is in the eye). This is exacerbated by ceiling fans overhead and air conditioning vents pointed at or over your bed. If you absolutely must have a ceiling fan on when you sleep, instilling an ointment prior to retiring for the night will keep the moisture from evaporating. However, in the morning when you awake, your vision will be very cloudy and you’ll need to rinse them to clear the vision. Use artificial tears to rinse the eyes, not water. Water will dry out the eye; however, you can wash the lids gently with soap and water to remove any excess ointment that may be stuck to the eye lashes. Wearing a sleep mask is another option. A sleep mask will help keep the eyes closed and block out most of the air. Even with a sleep mask, you may still wake up with dryness and need to use artificial tears to alleviate the irritation. Where Do Punctal Plugs Go? The next most common treatment for DES is punctal plugs. These tiny plugs are inserted into the puncta (the opening into which the tears drain) to keep the tears in the eye longer. Plugs are a great option for those who have moderate to severe dry eyes. There can be problems with punctal plugs, however. Some patients can be allergic to the materials in the plugs, which is usually collagen or silicone. Allergies can be managed with antihistamine drops such as Zaditor or Pataday, or the plugs can be removed. Infections can also occur, which typically resolve with antibiotics. In the case of chronic infections the punctal plugs should be removed. The puncta can also be cauterized (burned) shut. Punctal plugs can be removed, but once the puncta is cauterized, it’s permanent. 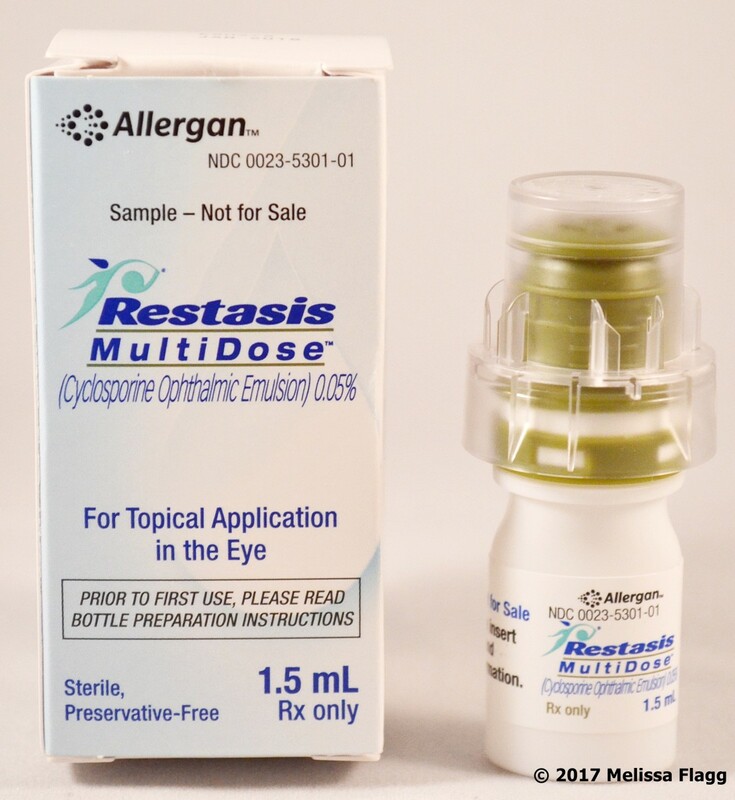 This is usually the last resort for dry eyes that don’t respond to drops, or plugs since it is a bit drastic. It works quite well however, and can be an option for those who had allergic reactions or infections from typical punctal plugs. For meibomian gland dysfunction, or MGD, a warm compress is placed on the eyes for about 15 to 20 minutes twice a day and artificial tears are used for comfort. Lid scrubs and topical ointments (such as Maxitrol) are given in cases of chronic inflammation and blockages. On occasion, when nothing else works, doctors will prescribe oral antibiotic treatment along with the other treatments listed previously. 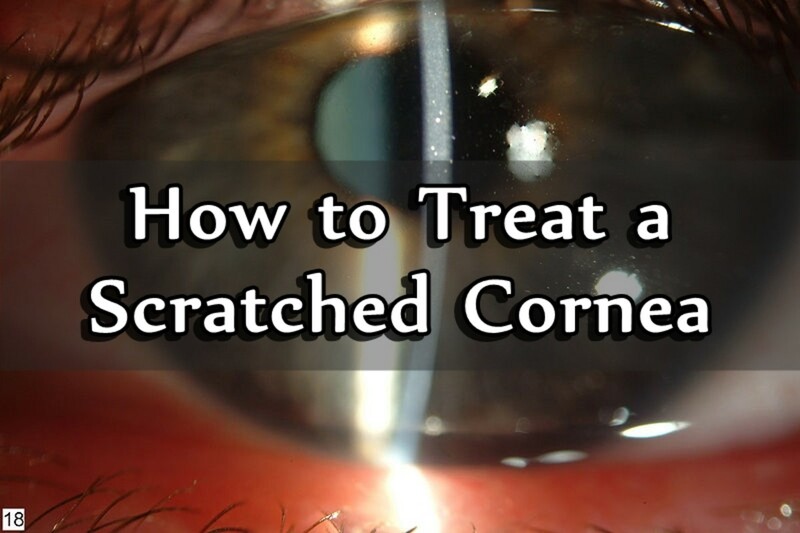 Blepharitis is treated easily with lid scrubs twice a day. 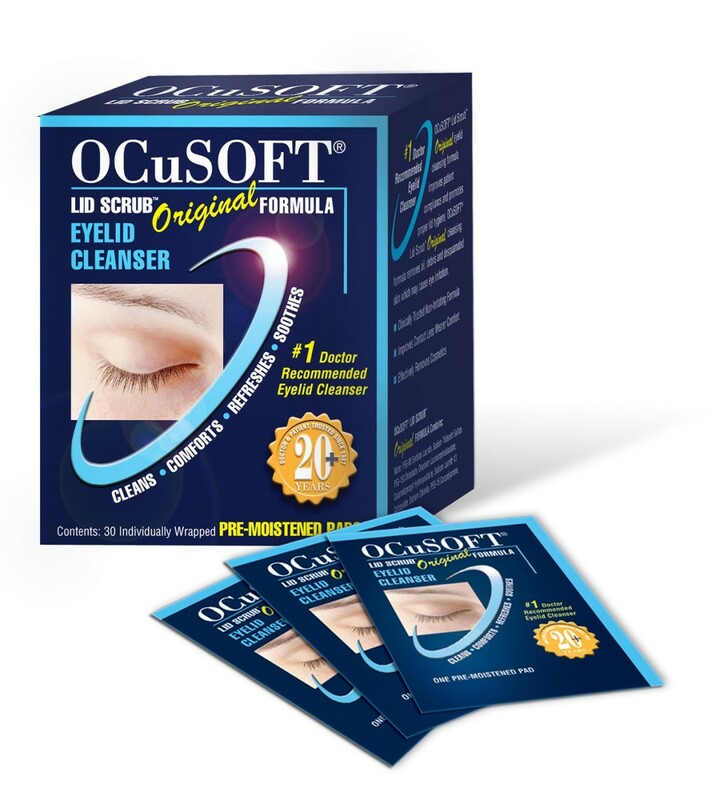 Scrubbing the lids with a commercially available medicated pad found at any drugstore can keep symptoms under control (Ocusoft makes an excellent one). A washcloth and baby shampoo can also be used to scrub the lids and alleviate symptoms. Warm compresses can help keep MGD from causing styes to form on the eyelid. Some cases of blepharitis don’t respond to the lid scrubs in which case antibiotic ointments applied to the lids twice a day is usually the preferred treatment. Maxitrol ointment is a common treatment for blepharitis and is usually given in combination with lid scrubs and warm compresses. In cases of autoimmune disease and DES that results from medications, only one treatment has proven effective for patients who have tried everything else. 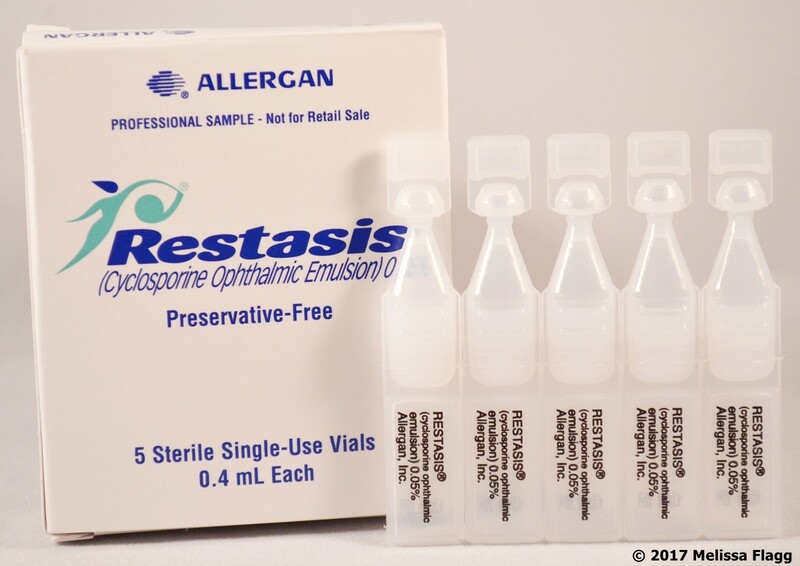 Restasis, or cyclosporine, is an ophthalmic emulsion drop that suppresses the immune system and prevents further destruction of the tear film. In the majority of patients, Restasis is given with Lotemax or Alrex for the first month due to the stinging sensation initially felt when the drop is instilled. After about six months to a year of continual use twice a day, most patients notice a dramatic decrease in their symptoms. For those whose symptoms are caused by the medications they take, Restasis is an excellent option if the medication cannot be discontinued. I get this question quite a bit. 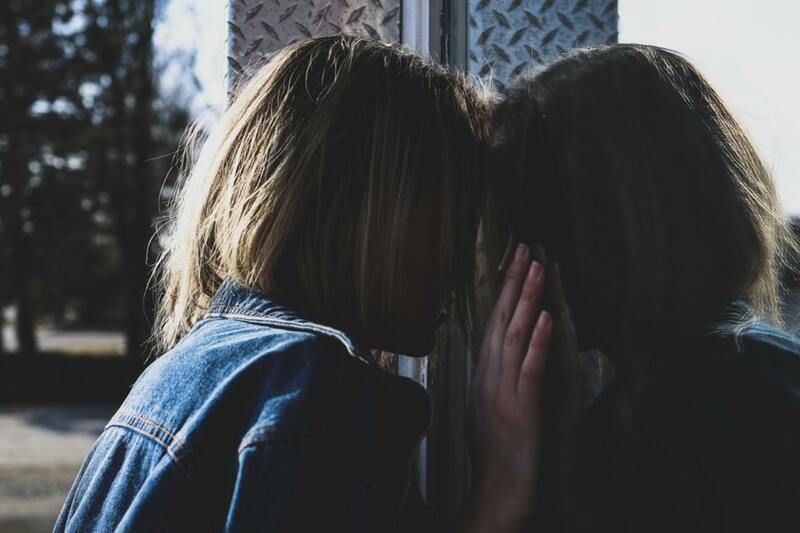 Unfortunately, there isn’t a whole lot you can do to prevent severe dry eye syndrome, especially if it is caused by an underlying autoimmune disease that has yet to manifest. Taking vitamins fortified with Omega 3-6-9 compounds, or drinking fluids fortified with these compounds (like hemp protein in almond milk) can help keep the tear film in good health. Scrubbing the lids with either lid scrubs or baby shampoo and a wash cloth can help prevent MGD and blepharitis. Managing environmental elements like ceiling fans and air conditioners can help prevent symptoms. When driving with the air conditioner on, point the vents down toward the floor, not directly at you or up at the windshield. Pointing the vents directly toward you is self-explanatory; the air goes directly toward the face. When the vents are pointed up toward the windshield, the air bounces of the windshield and right into your eyes. Taking breaks when working on a computer or reading is essential in preventing dry eye symptoms. I typically recommend breaks every 45 minutes to my patients who use a computer for long periods of time or who are voracious readers for at least 10 minutes to rest the eyes. Keeping rewetting drops nearby is also a good idea. One of the most important things a person can do to keep the eyes healthy is to wear sunglasses anytime you are outside. Even if it’s a cloudy day, there are still dangerous UV rays that can damage the delicate tissues in the eye. Always wear sunglasses, even if you think you don’t need to due to rain or cloudy weather. 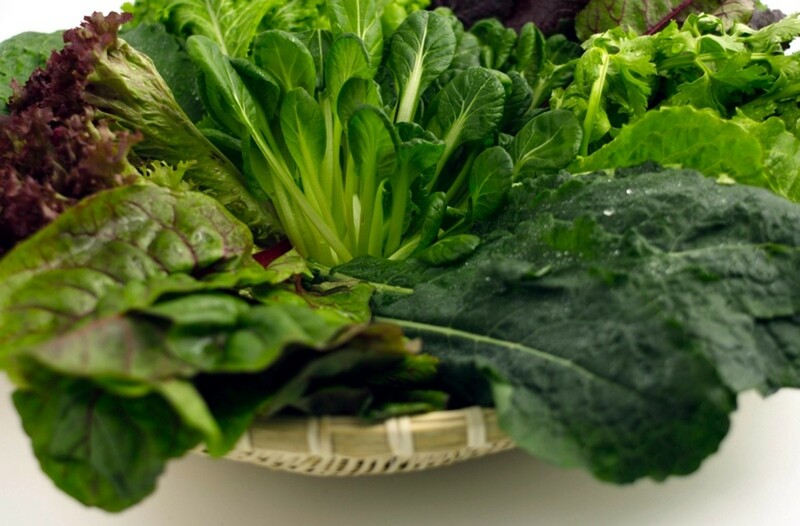 Last but not least, eat a diet rich in leafy green vegetables, fruits, nuts and omega fatty acids. A healthy diet will prevent free radicals from causing permanent damage and keep your eyes healthy long into old age. Ketotifen Fumarate Opthalmic Solution in addition to artificial tears. There are times my eyes are so bad tears run from my eyes and any light in the area assures that I cannot open my eyes. I put warm packs on eyes, however, the cycle continues and I notice it is becoming difficult to just open my eyes when I am outside. I also have been wearing the glasses given to me following cataract surgery. Please, how can I help myself? Are any of these related? Thanks for listening. My dry eyes (I've had RA since I was 19,I'm now 64) are doing well. My eye doctor had performed all of the above procedures and prescribed all the mentioned meds. I've had to take lots of medicines down through the years. My doctor from Morgantown, WV, now is making my eyedrops from my own blood. Amazing, but the only thing that worked! I could not believe it. I cannot or have not found a name for this. Could you possibly give me a name for this? I was ready to go to Cleveland Clinic , as I have for years for my joint replacements/ revisions , but to their Eye Clinic. I may still have to, depending on how long this procedure lasts. I get enough drops now for 3 months, and I pray I can continue to do so. Is there anything else out there in case this wears out? Thank you in advance for your response. a very useful information is given above but I'm looking for more as I'm suffering from the severe stage of DES!! it's extremely painful. I've used restasis, lotepred, optive and many more eye drops and lubricating jel as well but none of those could work. currently I'm using softdrops i drop in a huge frequency( more than 20 times a day). if any of you knows about a better eye drop, please inform me at saxenaisha00@gmail.com. I really appreciate the information here. Many mornings I literally can't open one or both of my lids and I have to pry them open with my fingers. As a writer I used my computer a lot so it was good to find out it can be a problem. I have tried to gel drops and I find them somewhat helpful but not consistently. My primary care doctor has a severe case herself and is pretty knowledgable but I learned a few things here. Thanks. I have suffered with dry eyes when waking up from sleeping for 20 years! I use miro 128 ointment. For the last year I cannot open my eyes in the morning without rubbing my eye lids until my lids can open! If I open my lids without rubbing them I suffer severe pain for about 10 minutes, I have to,d my eye doctor this & my medical doctor! They don't seem to have any answers to my problem! I also suffer from dry mouth & dry lips! I have had blood work done for sorejans (sp) & the doctor said it was negative! Does anyone else have these problems? Great article Melissa! I'm only 29 but have recently (over the past year) been suffering from eye allergies and dryness and find this very useful. My optometrist has done all kinds of tests and says I have healthy eyes but he recommended I get my family physician to look into testing for auto-immune diseases such as Sjorgen's! I've done my bloodwork and am now just waiting on those results! I hope it's just dry eyes and not an auto-immune condition because it sounds like that one is a lot more difficult to deal with and of course has implications beyond just eyes. I had my puncta cauterized two weeks ago. I was allergic to the plugs my eyes itched constantly and had plugs removed. Now that tear ducts are closed by cauterization my eyes have watered constantly. The tears flow onto my face for they have no drainage. This is driving me crazy/. I have very little vision and cant read clearly. I have Dr.visit in a week so I hope this stops. My eyes are soo sore from tearing all day long. I am lucky I was off from work-could not work in this condition which Dr did not mention. Thanks for all the research that went into this article. Good to remember to take breaks from staring at the computer! I was worried about using the artificial tears drops but glad to see you recommend them. thanks for the response and no worries about the delay! I went back to the hospital shortly after posting that and thankfully it just turned out to be dry eyes after all. I got prescribed some eye lubricants for a month and they seemed to do the trick, no more pains ever since. I had my bloods tested not long after I was diagnosed with Iritis and they came back normal, although I did test positive for HLA-B27. The pains you are describing do sound a lot like dry eyes, especially if you are waking up with it in the morning. Most of us actually sleep with our eyes slightly open, which means air can easily get in and dry out the cornea. This is exacerbated by a fan in the room or air conditioning vent over the bed. But since you've also had a bout with iritis, I would suggest having your doctor order blood tests to look for an autoimmune disease such as Sjogren's or rheumatoid arthritis, possibly even lupus. 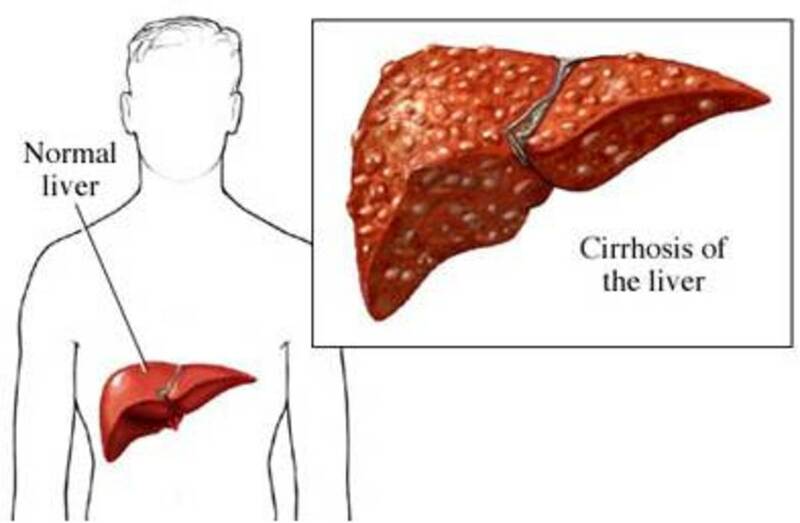 Iritis is typically the result of an autoimmune disorder. I would also recommend taking vitamin C 1,000mg four times a day, this can help reset your immune system if there is an autoimmune disorder. The subtle pulling sensation and mild headaches are usually the result of an inadequate prescription, so you may also want to have that double checked. Hope that helps, and so sorry for the delay in responding, I had a family emergency to deal with. Interesting article! I'm in my late twenties and have been a lot more eye conscious ever since my first (and so far, 'only') flare up of Iritis a few months ago in my left eye. But I noticed that even when the Iritis was clearing up, I would still get these very mild pains in either eye (but mostly my left one). Two eye doctors couldn't see anything wrong with them, and I was later cleared from the Iritis. I saw an optician the other week and he said I have healthy eyes too (but prescribed glasses for astigmatism) but I didn't mention anything about any pains as I'd not had any for a while. I'd used dry eye drops a week or so prior to this, so perhaps that's why. But lately I've been getting these really mild pains every now and then and have been told (online) that it may be due to dry eyes. I use a computer a lot for work, and have recently started wearing my new glasses. I've bought some eye drops for dry eyes which I think help my symptoms a bit, which I now use 3 times daily. I only really notice it when I've been using the computer a lot. My eyes sometimes feel irritated / itchy. Occasionally I have a foreign body sensation, and I sometimes get a mild pain or subtle 'pulling' feeling. As well as occasional mild headaches. Sometimes I may notice it a little in the morning when I wake up, which seems strange as I wouldn't have been on the computer for a good 10-12 hours. Thanks Shyron! I'm working on it. Trying to fit it in my already hectic schedule is now my main issue. I'm glad your happy with your ReSTOR lens. Do you have any problems with glare at night? I know quite a few patients complained of glare, and I was wondering if they had upgraded the lens to fix the problem. Daughter of Maat, I read your comment on diogenes hub and, as I have had cataracts in both eyes, you sounded interesting and I was right. I have the multifocal intracular lenses (i.e. ReSTOR lens implant) they are awesome, I do have a problem with dry eye, but my doctor is adressing the problem. I do hope you go back to school ASAP. How old are you rahul? I'm going on the fact that you look young in your profile pick, so... even temporary dry eyes can signal an autoimmune disease. If you're in your 20's, even staring at a computer for 8 hours shouldn't cause dry eyes. Mild symptoms maybe, but it depends on how mild they are. I only say this because many patients with lupus, or Sjogren's syndrome (as examples) or other autoimmune disease aren't typically diagnosed until their late 30's early 40's and by then damage has already been done. Keep an eye on it (no pun intended) and notice if the symptoms have a pattern. I had dry eyes in my 20's and it was chalked up to being a contact lens wearer, but it was caused by osteoarthritis. Just a thought. Thanks again for your comments and thanks for sharing! Always appreciated. Another outstanding hub. Voted up, useful, awesome and interesting. Well done. Hello Daughter of Maat. First, thumbs up. This was an excellent hub providing a generous amount of information that's really meaningful. Since I'm at a computer a lot, I have to use eyedrops. And I also wear glasses. Well written and organized hub. Thanks much.